Aly Raisman celebrates on the podium after winning a silver medal in the floor exercise at the Rio Olympic Arena, Aug. 16. The Jewish news from the Rio Olympics was almost as compelling for what didn’t happen as for what did. Things started off on a sour note when the Lebanese team blocked the Israeli delegation from boarding the bus heading for the opening ceremonies. Then there was Islam El Shihabi, an Egyptian judoka who refused to shake hands with Or Sasson, the Israeli who bested him in their match. Sasson would go on to win the bronze in the men’s heavyweight division. It was one of two medals won by Israel; Yarden Gerbi also won bronze for judo in the women’s half middleweight competition. Gymnast Aly Raisman may have concluded her Olympic career by winning three more medals: a gold for the women’s team and silvers in the all-around and floor exercise. 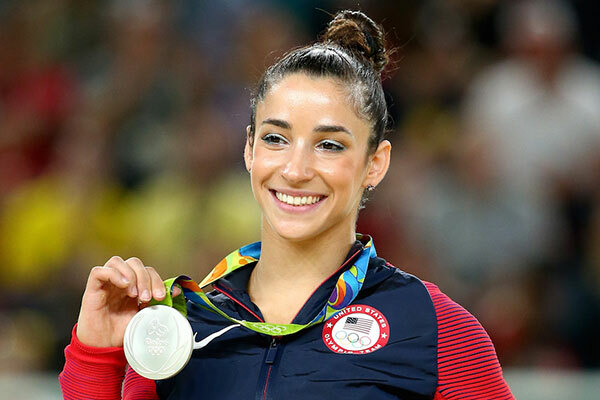 Raisman now has six Olympic medals; she also won three at the 2012 games in London. Perhaps it’s the afterglow talking, but she has said she’s not counting out a return to the 2020 Olympics, which will be held in Tokyo. Anthony Ervin became the oldest Olympic gold medalist in an individual swimming event at 35 when he edged France’s Florent Manaudou by one one-hundredth of a second in the men’s 50-meter freestyle race on Aug. 12. Bregman still blasting: Houston Astros Rookie third baseman Alex Bregman has four home runs since being promoted from the minors. He seems to have established a pattern: Bregman has hit a home run every other day since Aug. 16.